Your Detroit Diesel Crankshaft Dampers absorbs the torsional vibrations and shock waves generated each and every time the power stroke is produced in your engine's cylinders. The proper control of this twisting motion is continuously monitored and controlled by installing a Vibratech engine damper to your crankshaft. 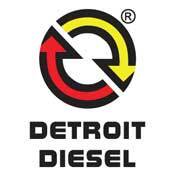 No other engine damper controls torsional vibration on your Detroit Diesel engine then the Vibratech viscous dampers. To ensure a long trouble free engine life, we recommend replacing your damper with a Vibratech crankshaft balancer. A crankshaft damper prevents crankshaft breakage and damage to other related engine components. Vibratech crank dampers are the highest quality American Made damper available. The Vibratech TVD® Heavy Duty Diesel Dampers are designed for the efficient control of the restrictive torsional vibrations on your stock to fully modified Detroit Diesel. Detroit Diesel 8.2L V71 Series diesel engine. Detroit Diesel Series 60 11.1L diesel engine. Detroit Diesel Series 60 12.7L diesel engine. Detroit Diesel Series 60 14L diesel engine. KLM Performance recommends regular damper inspection along with replacing your crank damper every 300 to 500 thousand miles or at the recommended service interval. Regular inspection and replacement of your Detroit Diesel engine damper will prevent the excessive maintenance costs you will incur when the engine fails. Replacing your crankshaft damper is far less expensive than breaking your crankshaft or dealing with the other problems caused by deteriorating damper function. Think about purchasing a new heavy duty crankshaft damper as an insurance policy against a future broken crankshaft and you will feel the engine run smoother. As a result of Vibratech TVD's engineering, experience and ISO 9001:2008 accreditation. Vibratech TVD manufacturers with the highest quality control standards to produce dampers that are constructed to achieve 500,000 miles of protection against critical torsional vibrations and crankshaft damage. KLM Performance is a master distributor for the Vibratech TVD - Torsional Vibration Dampers. Vibratech TVD is a global leader in viscous damper manufacturing, engineering, and torsional vibration analysis for the trucking industry. With over 70 years of viscous damper experience, you can be assured that torsional vibrations will be controlled. Please feel free to contact us if you have any questions relating to replacing your diesel engines crankshaft damper. The Vibratech Liquid Filled Detroit Diesel Series 60 Dampers are MADE IN THE USA!